Normal guitars don’t tend to stand up to a lot of traveling unless you baby them in a bulky case, which is why KLŌS is such an interesting brand. 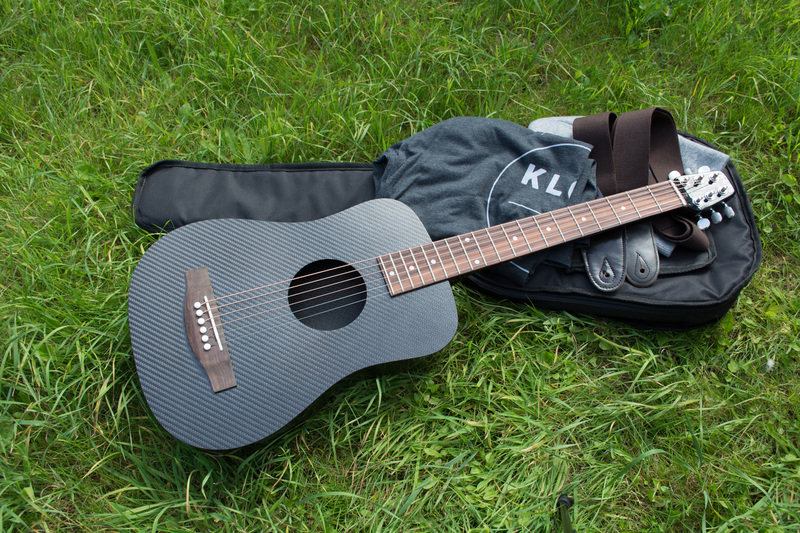 I was sent the KLŌS 2.0 carbon fiber travel guitar to review, and whilst I knew the KLŌS 2.0 carbon fiber guitar was going to be good, I just didn’t think it was going to be this good! The KLŌS 2.0 guitar, like the original, is handmade and designed in Salt Lake City, Utah. KLŌS guitars were founded by Adam and Ian Klosowiak through a previously successful Kickstarter campaign to bring the original KLŌS carbon fiber travel guitar to consumers through an iterative prototyping process after funding of $34,000; they’re now almost up to $100,000 with their latest Kickstarter campaign. The promotional videos for the KLŌS guitar show people playing baseball and tennis with the guitar as a makeshift bat, mitt, and racket. There’s even a video of the creators paddling a boat using the guitar as an oar, and there’s even a video of the guitar being used as a golf club. If you’re however more into the classical acoustic guitars, there’s plenty of that to go around too. I actually really like the light strings that ship with the guitar, no need for a pick, although you can change them out very quickly when necessary. KLŌS recommends that you only install 11 or 12 gauge strings on the guitar. 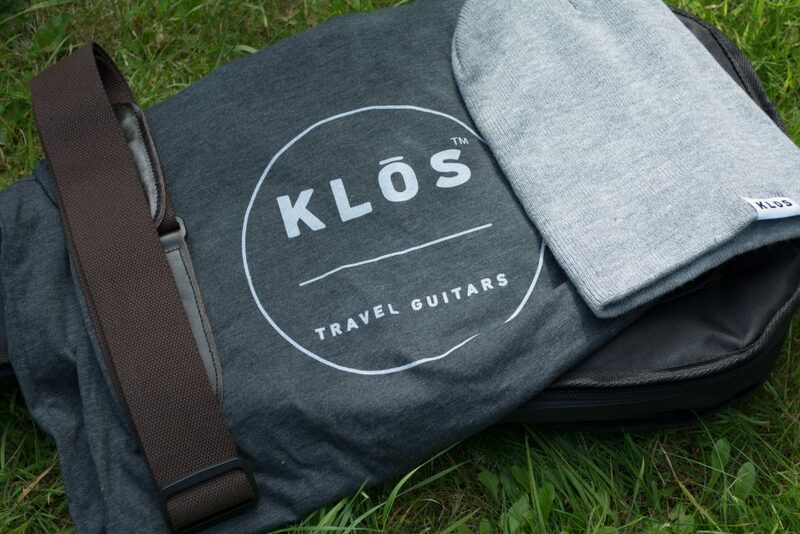 The package going out to Kickstarter backers in four months also includes the addition of a trucker hat, custom action, and a custom engraving—but we just couldn’t wait to share KLŌS Guitars with our readers. The black soft shell gig bag is nicely made, featuring 10mm of foam, and is secured by a zip spanning two thirds of the perimeter, and also features two adjustable shoulder straps, and an outer pocket for accessories. 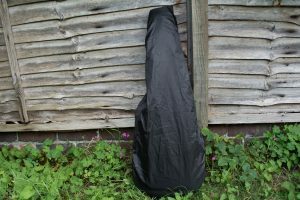 The black rain cover features an elasticated perimeter for easy attachment and removal. The brown canvas strap that comes bundled with the guitar is of average quality, but it’s still one of the nicer straps I’ve encountered, and let’s face it, anything attached to the anodized black aluminum strap pin buttons on this carbon fiber beast is going to look awesome. As somewhat of a guitar purist, I thought it might take a while before I enjoyed playing a carbon fiber bodied guitar, but it was instant love due to the balance between high-tech and high quality traditional materials; the bone nut and saddle situated on the rosewood bridge provides a nice organic contrast to the sleek, futuristic appearance of the carbon fiber composite, and ABS plastic bridge pins. All but the front side of the body feature a glossy coating on top of the carbon fiber, and there’s solid reasoning behind this. The lack of gloss on the front side of the guitar means that you won’t get fingerprints all over it, or scratch it whilst playing. 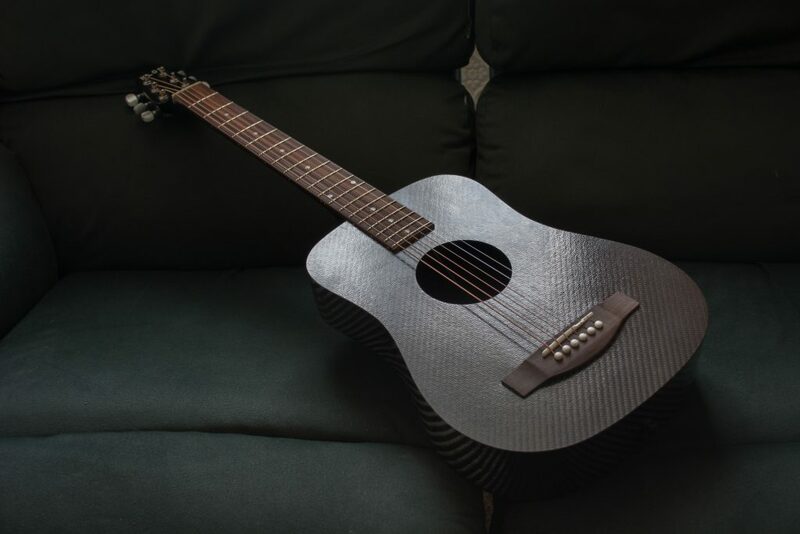 The KLŌS 2.0 guitar is exceptionally lightweight due to it being primarily made of carbon fiber, weighing in at a measly 2.85lbs. This means that even my girlfriend is starting to get more into guitar as she isn’t weighed down by the guitar whilst trying to relax. I’ve owned laptops in recent years that weigh more than this guitar does, even the Surface Pro 2 and Power Cover I use on a day-to-day basis almost weighs as much as this guitar does. The guitar is the perfect size to lay back in a recliner and play, or to laze around in bed or in a car with. Being able to take a guitar everywhere with me has meant that I’ve written more acoustic music in the past few days than I have in months, and the ideas just seem to keep pouring out of me. Better yet, if you need to decrease the size of the guitar even further, you can remove the neck just like an electric guitar, almost halving the vertical footprint of the guitar, making it suitable to pack inside of a suitcase or backpack; ideal for my next flight to Berlin. I’m very impressed with how the KLŌS 2.0 guitar holds its tune during travel; most of the time it doesn’t need retuning. When it does, it is only marginally out of tune, meaning it’s ready to get out and play at pretty much any time. 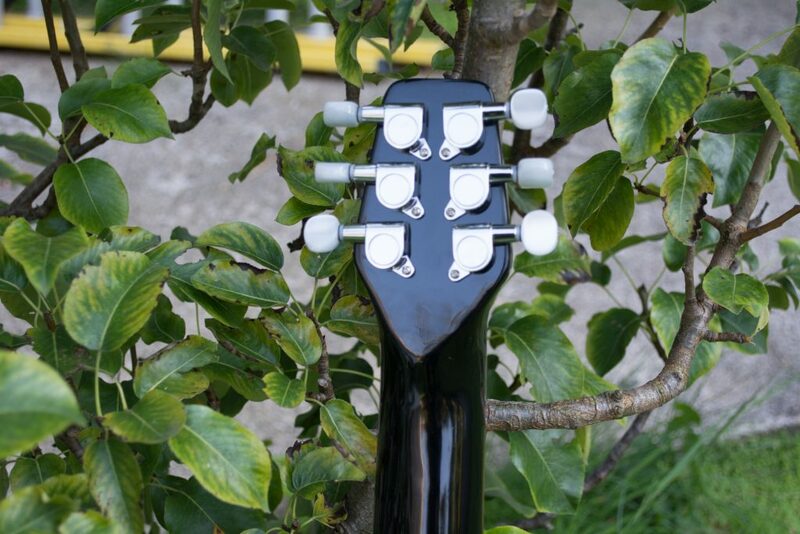 The KLŌS 2.0 guitar’s black gloss lacquered mahogany neck sits nicely in the hand, and is the main reason that it ships with a rain cover, alongside other organic elements such as the spruce soundboard bracing. Because despite the video showing the guitar being used in water as an oar, it’s not something particularly recommended if you want to enjoy a lifetime of service from the instrument! Above the top of the steel truss rod, the ABS pearl machine heads, and crisply machined tuners, there’s a fairly subtle and stylish KLŌS logo that is far more tasteful than the logo on the original version of the guitar, giving a more sophisticated, adult aesthetic. If I was going to be picky about quality, the headstock logo on my particular unit, unlike the ones featured on the KLŌS website, is a little rough around the edges, and contrasts upon close examination against the otherwise tight execution of the overall design of the guitar as a whole. Though keep in mind that my unit is a prototype and little finishing touches like this are probably going to be ironed out by the time it ships to Kickstarter backers. KLŌS lets you choose what kind of an action you want when you order; I opted for the default low action as I’m more into finger-picking than anything else, but the guitar works beautifully for typical strummed chords too. The 19 fret rosewood fingerboard is easy to navigate with brilliant intonation, which I checked with a tuner. Shockingly, despite being a travel guitar, it really feels and plays like a full-size dreadnaught. The KLŌS has a pleasingly bright tone, presumably due to the small size. The tone, although very similar to a standard wooden bodied acoustic guitar, has a sound of its own, perhaps a little more metallic to my ears. I’m really beginning to prefer the sound of the KLŌS body; it’s got a sound of its own that’s distinctively different on a recording to stand out from traditional wooden bodied acoustic guitars. This guitar is unbelievably loud across the frequency spectrum for its size, and there’s a lot of punch coming from its 3.75″ diameter sound hole. The mini dreadnaught style carbon fiber body really resonates, offering a surprising amount of sustain for a guitar of this size. Although I initially intended to just use this guitar for travel and performances at smaller, intimate venues, I’ll actually be looking into a clip-on pickup system as I’m that impressed with the sound and playability. The KLŌS 2.0 is a really lust-worthy axe; you’re sure to be the envy of fellow guitarists and non-players alike due to the superb build quality and eye-catching design. Anybody with even a passing interest in engineering or familiarity with carbon fiber (cyclists and Airbus employees in my case!) will be asking you questions about this guitar. If McLaren or Bugatti were going to manufacture guitars instead of supercars, the KLŌS 2.0 guitar would be it; taking the best of old and new, whilst engineering everything to be as lightweight as possible for maximum performance in its designated purpose. A KLŌS guitar is suitable for children to use and abuse due to the rigidity of the materials used and the size of it, and it is also available in a left-handed configuration; simply specify the need during the checkout process when ordering your guitar. The KLŌS 2.0 guitar is a serious piece of gear that I am happy to recommend to both beginners and professionals alike. There are plenty of other brands out there offering similar products, but I’ve not seen any that tick the boxes quite like KLŌS does for a sensibly priced, high quality instrument that isn’t a toy or a gimmick. The price for Kickstarter backers with strap, capo, gig bag, rain cover, and neck sleeve is just $499. The limited edition coloured KLŌS guitars are available for $799. 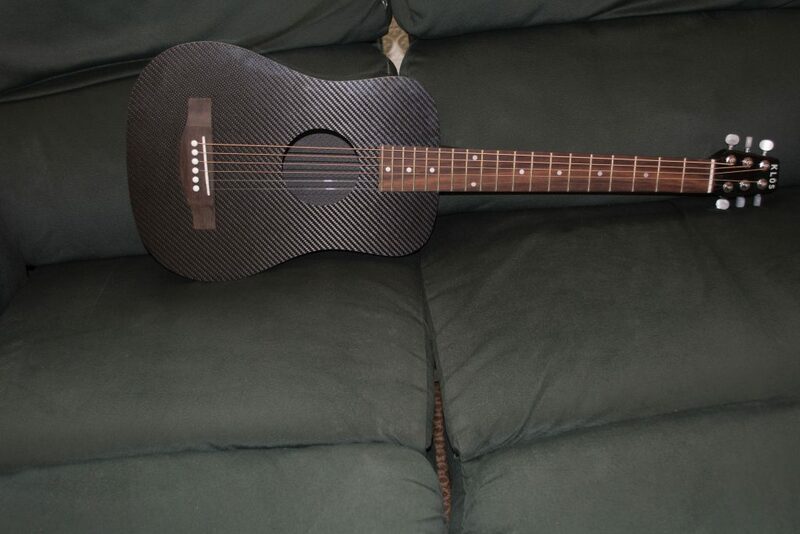 It’s hard to go wrong with a carbon fiber guitar made in the USA. Supporting American manufacturing is easy when the product is better than anything being mass-manufactured elsewhere. KLŌS Guitars also ship worldwide as the guitar weighs very little! You can buy a KLŌS 2.0 guitar by backing the KLŌS 2.0 guitars Kickstarter, but the Kickstarter packages are limited, so make sure you act fast! Acclaimed insomniac cypherpunk, CEO of Split An Atom and Previous Magazine. Developer and producer. Scores movies & TV. Makes music as The Orion Correlation on Voidance Records.